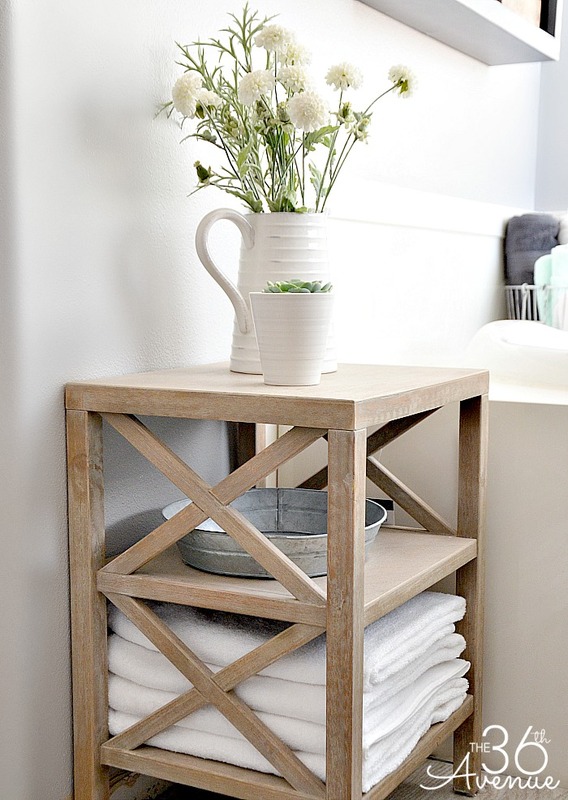 9Bathroom storage ideas can be practical and beautiful. I love to decorate with items that are useful. 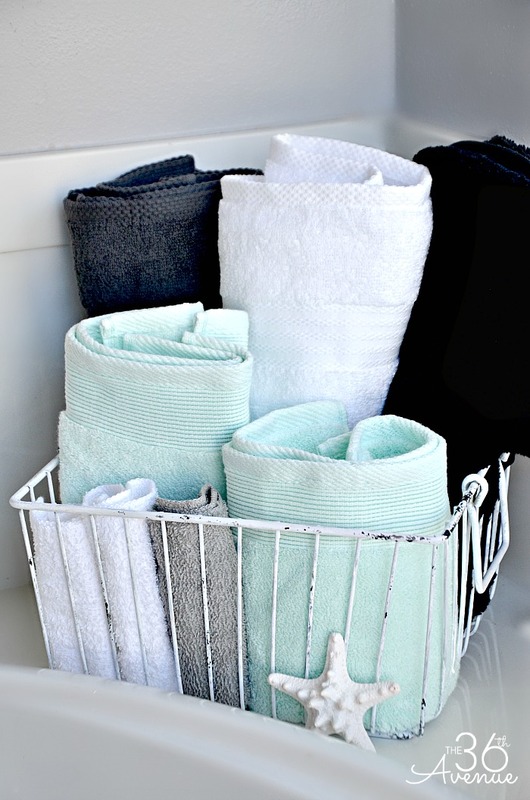 Today I’m sharing a few bathroom organization tips that you can keep on display. These storage solutions are perfect for small bathrooms or spaces that have limited cabinet space. Let me show you! For the last few weeks we’ve been working on a serious bathroom remodel. I asked our carpenter to build a small shelf unit t0 match the color of our new cabinets. Don’t feel like you need to have a custom piece to achieve this look; a small bookcase or shelf will do. 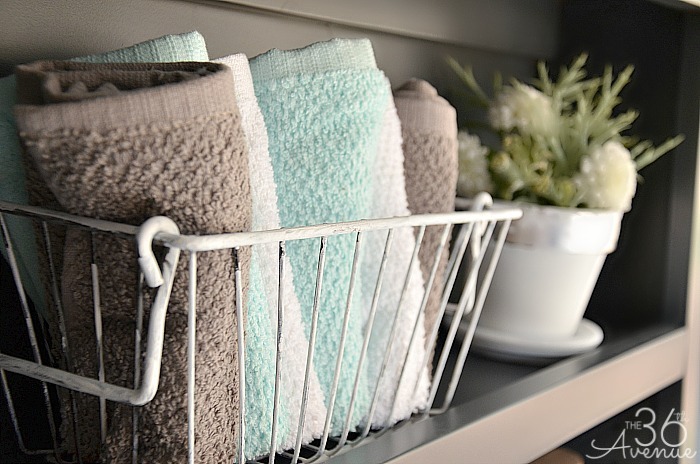 Let’s take a closer look of our bathroom storage! I used a small metal basket to hold wash rags. I couldn’t find one in white so I used white chalk paint and sand paper to make it look just like this. 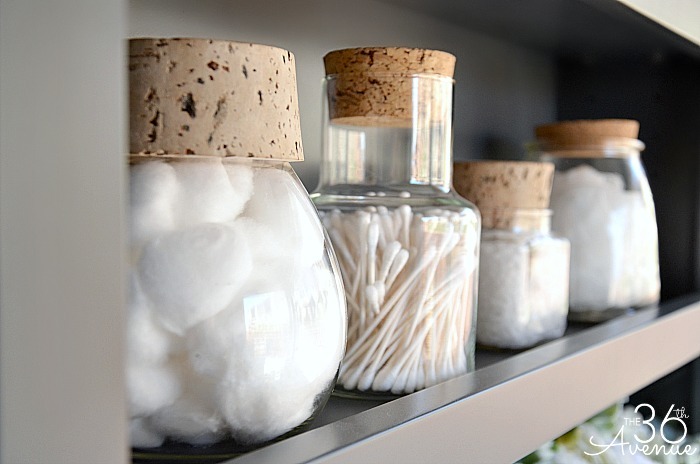 Glass containers and jars are perfect to hold small items like q-tips, cotton balls, bath salts, and sponges. I found all of these jars at different times in different thrifty stores and yard sales. I think they look great! 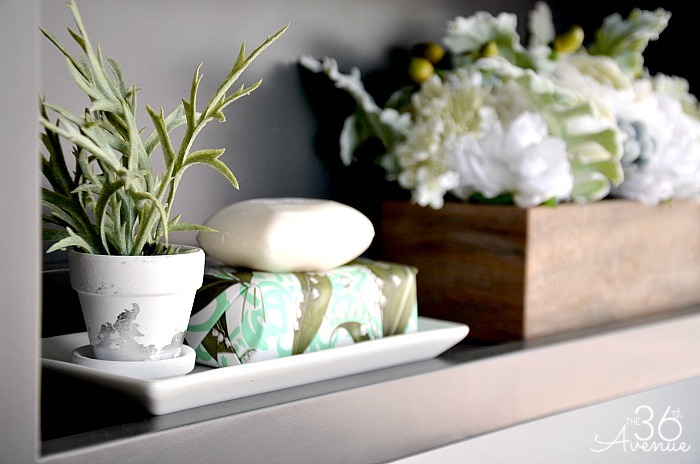 Small platters and plates are perfect to hold soaps and items like jewelry. I made two different size Terracotta Pots for this shelf and they turned out super cute! You can find the tutorial for these pots HERE and at the end of the post. I also used a larger metal basket to hold bath towels. When you don’t find exactly what you are looking for don’t be afraid to change the color using paint! I used a small side table to store some extra towels and display flowers and plants. 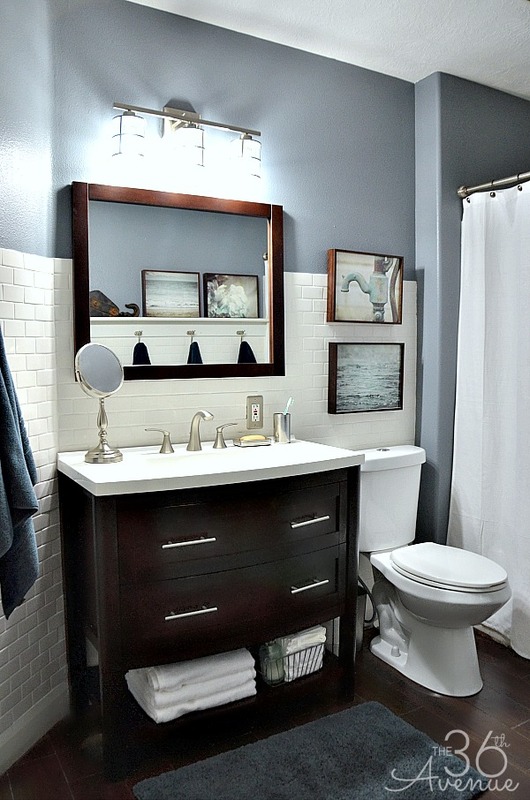 Yes, you can put a table in your bathroom! This is also the perfect spot to rest a book and light up some candles while taking a bath. I can’t wait to share with you the rest of our bathroom! 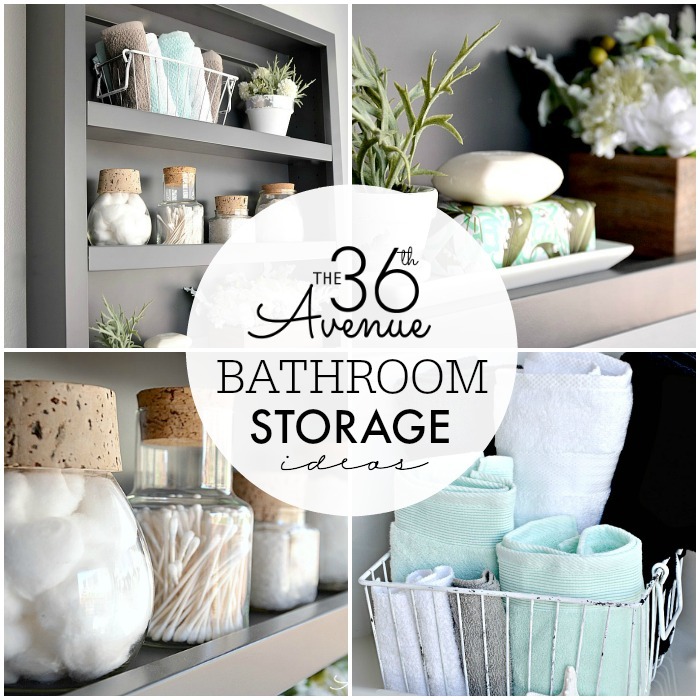 Until then here are some other Bathroom Storage Organization and Decor Ideas that I love. Where did you get the gray shelf from? The same carpenter that made our cabinets made it for us! I love the glass bottles with the cork, where were they purchased? I found some at Target a few years ago. 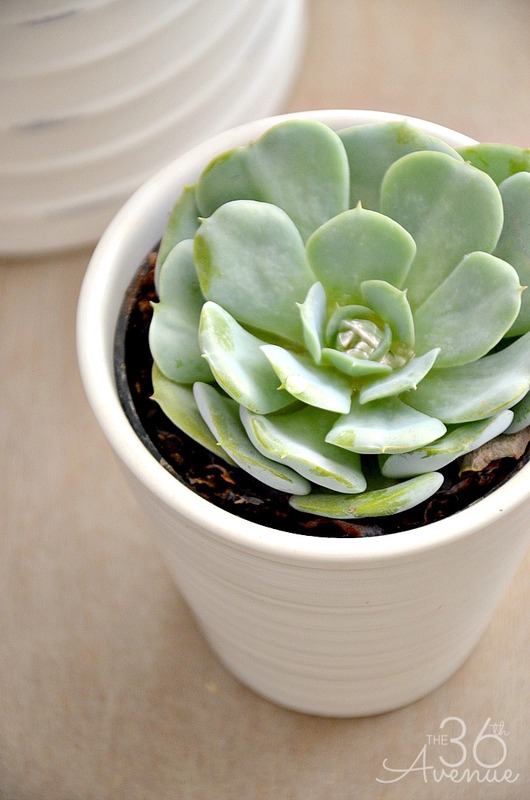 Sometimes you can find similar ones at craft stores like JoAnns or Michaels. I found it at HomeDepot! 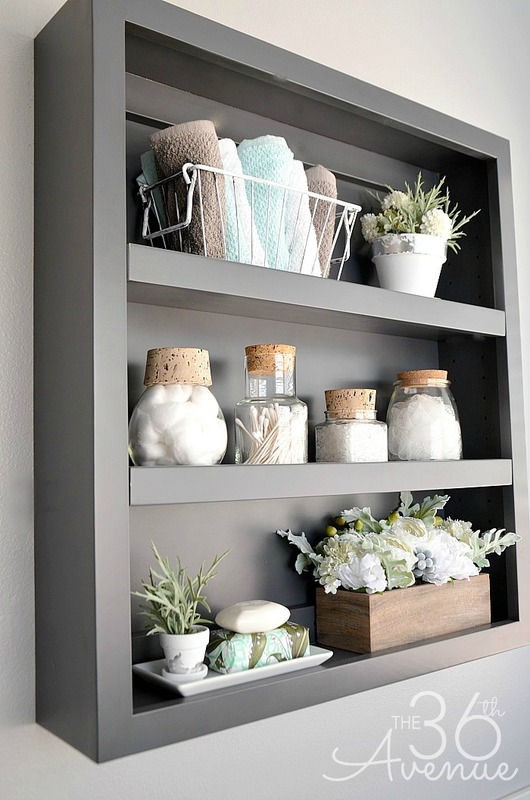 What is the color of the grey shelf? I wish I knew… I bought it already like that! Where did u get those mint colored towels? They’re Soo pretty! Jamie, they are from Target.